I’ve come up with a handful of one-liners to the curious question of why, after eight years of marriage, I still don’t have kids. “Because I don’t want kids” is a blunt, if not incomplete, response. “Because I want to be available to other people’s kids,” is true, if not pietistic. Of all the one-liners I’ve tried, the one that feels most honest is often hardest to defend: “I’ve just never thought pregnancy was one of life’s must-have experiences.” Especially when shared with someone who has chosen to procreate, the answer is hard to give. The answer means I don’t want what you want. 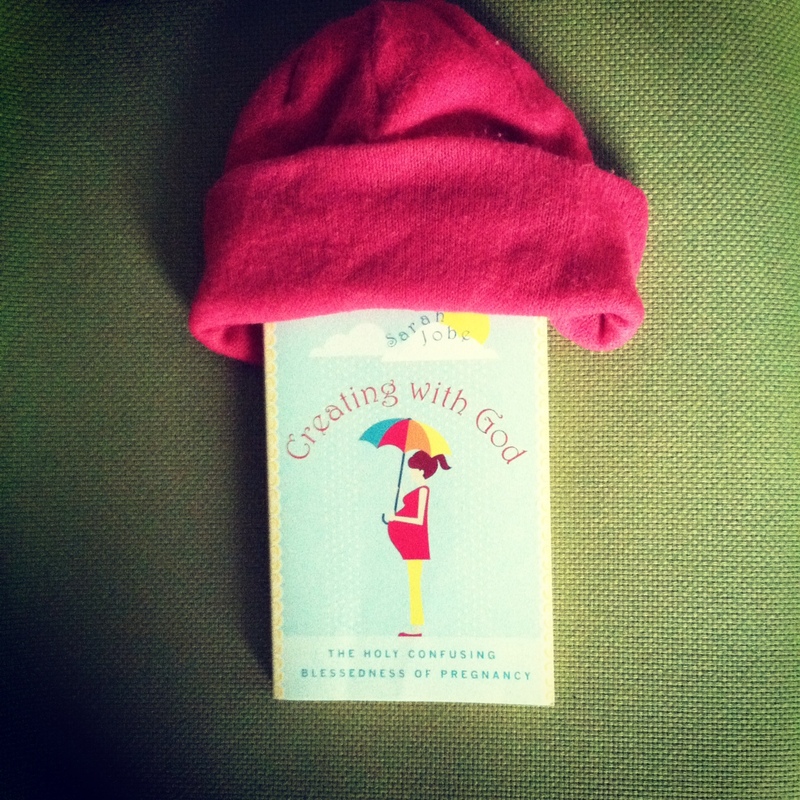 It wasn’t until I read Sarah Jobe’s Creating with God: The Holy Confusing Blessedness of Pregnancy that I not only felt the ping of writer’s envy, but also the first ping of pregnancy envy. I had never considered the morning sickness, constant constipation, and boundary-breaking belly touching of pregnancy to be anything more than speed bumps on the road toward reward. When I learned that our bodies experience an effect akin to smoking weed during labor so as to forget the intense pain and remember it fondly enough to do it again, my point was confirmed. Anything that required a high to endure wasn’t worth the effort. Jobe turned it all around for me. In what is one of the best pieces of biblical feminist scholarship I’ve read on the subject to date, she proposes that pregnancy is not just an act of housing God but rather becoming like God. Women are not empty vessels by which God implants his holy seed but instead are co-creators in the divine mystery of making something out of nothing. In the Judeo-Christian creation story, Eve exclaims, “I have made a man with God!” (Genesis 4:1). Jobe explains, “Eve says nothing of having God’s ‘help’ in the matter. She uses a short proposition that very plainly means ‘with.’ She doesn’t create with God’s help. She created with God.” The claim, Jobe says, is startling. So is the rest of Jobe’s book as she expertly weaves scriptural exegesis with personal storytelling that is both charming and candid. It’s her matter-of-fact tone – no doubt an asset in her work as a pastor, prison chaplain, and doula – that prevents the smack of sentimentality that so often turns me off from all things mother-to-be. Instead, she writes about the goodness of guttural groaning (Romans 8:26), the gift of people wanting to touch you (Luke 8:42-46), and the privilege of bearing pain for a purpose (Galatians 3:17). Pregnant women image not only Christ but also the church in as much as they create a dwelling place for both God and her children to abide (John 15:4). While pregnancy enthralls me, it does not excite me. When friends talk about it, I nod my head like they are talking about a trip to China I will never book. I don’t have enough time or energy to see every square inch of this world called experience. Choices must be made. There are other countries that have my heart. Even if they are less traveled, the possibility of meeting God in their landscapes is no less real. Maybe I want what you want after all. This book is one of my favorites of all time. It was the first moment that I, too, realized that pregnancy wasn’t just a tough journey to a goal, but rather a holy experience in and of itself. I particularly savored the imagery she used comparing the Eucharist to the nourishment a woman gives to the tiny human growing inside of her. Reading your thoughts makes me want to re-read Sarah’s book again (although I recently gave away my last copy!). I’m so glad to see your perspective on this, as I’m continually enthralled by the new eyes you give me to feminism and theology. Oh Erin, you have made me want to read this book. I can already tell that Sarah and I will get along fine.